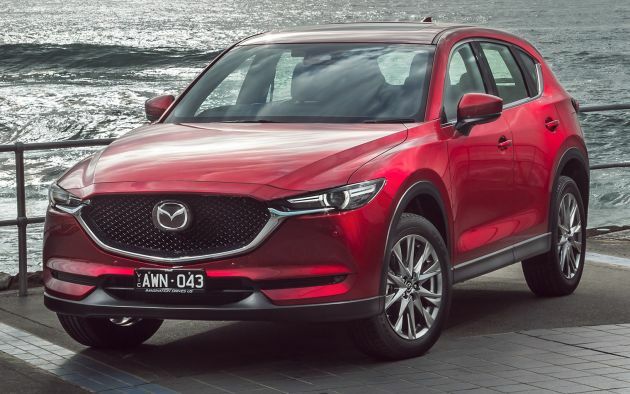 The updated Mazda CX-5 was introduced in Japan last month, and now it has made its way to Australia. The refreshed SUV arrives Down Under with slew of subtle changes, as well as a big one under the bonnet. What’s that, you ask? Well, the car is finally being offered with the turbocharged version of the 2.5 litre SkyActiv-G four-cylinder petrol engine, producing 230 PS at 4,250 rpm and 420 Nm of torque at 2,000 rpm. Available on the GT and Akera trim levels, it is paired to a six-speed automatic gearbox and all-wheel drive, joining the naturally-aspirated 2.0 litre and 2.5 litre petrols and the 2.2 litre SkyActiv-D turbodiesel. Elsewhere, Mazda has added the enhanced G-Vectoring Control (GVC) Plus system that lightly brakes the outside wheels coming out of a corner to providing extra stability when straightening the steering wheel. This is claimed to improve handling in collision avoidance manoeuvres and add a feeling of control when changing lanes and when driving on snow or other slippery surfaces. Other changes include Apple CarPlay and Android Auto compatibility, a Grey Metallic finish for the 17-inch alloy wheel option, redesigned climate controls and LED number plate lighting. On the safety side, Smart Brake Support (SBS), Mazda Radar Cruise Control (MRCC), Driver Attention Alert (DAA), High Beam Control (HBC), Lane Departure Warning (LDW) and Lane-keep Assist System (LAS) are now fitted as standard. The range-topping Akera trim has also been revised and adopts elements from the new Japanese-market Exclusive Mode. These include new dark gloss 19-inch alloys from the CX-8, Red Nappa leather upholstery, real woodgrain interior trim, a frameless rear-view mirror, ventilated front seats, a seven-inch TFT LCD instrument display and white LED lighting throughout the cabin for a more consistent look. Pricing has gone up between AU$480 (RM1,500) and AU$1,080 (RM3,300) across the range, and now starts at AU$29,770 (RM90,300) for the base Maxx variant with a 2.0 litre NA engine, two-wheel drive and a six-speed manual gearbox. However, for the new turbo engine you’ll have to pony up AU$46,970 (RM142,500) for the GT or AU$49,170 (RM149,100) for the Akera. Speechless. Powered tailgate & now this..
Wow so cheap. Aud29k only. Can Malaysia also sell RM29k also?? Easy to buy this car. Work harder, then you can afford for this car. Don’t u tired trolling everyday? This car so affordable to even a kuli in Australia. Even prices in Aussie went up. If this Mazda CX-5 here, habislah Hyundai Santa Fe and Toyota Fortuner. As Hyundai Santa Fe gives lousy resale value including other Hyundai Models, moreover Sime Darby Hyundai Malaysia gives new CKD Hyundai Santa Fe is actually giving overpriced from 190k – 210k. As well as, Other Hyundai Models looks damn ugly and no inspiration and no proportion, just copying from other carmakers. Sure, everyone will not going to book and buy new Santa Fe. Especially that Everyone will also not going to buy Toyota Fortuner. Not only UMW Toyota gives overpriced Fortuner, Toyota Fortuner looks ugly, uninspiring and absolutely boring as well as UMW Toyota also giving outdated engine like Camry. As overall, everyone will surely buy Kia Sorento, Mazda CX-5, Honda CR-V or Nissan X-Trail cause these cars have good resale value, more inspiration, more proportional and their design looks much better than junk Toyota Fortuner and Hyundai Santa Fe. Proton Pondan Fan Club (PPFC) say Proton X70 better than this CX5. No, I owned a Proton now because I can’t afford a Mazda. Period. Nope, myvi lagi best. True story. Work harder, then you can afford for better quality Protons. Wonderful..please come to bolehland..be a tough rival to cr-v..